The Blair Conversations Series returns Monday, Dec. 9, with Senior Lecturer Jen Gunderman conducting an informal on-stage conversation with rock legend Peter Frampton, followed by a Q&A session with the audience. Frampton remains one of the most celebrated artists and guitarists in rock history. At 16, he was lead singer and guitarist for British band The Herd. At 18, he co-founded one of the first supergroups, seminal rock act Humble Pie. His session work includes such legendary artists as George Harrison, Harry Nilsson, David Bowie, Jerry Lee Lewis, Ringo Starr, John Entwistle and many others. 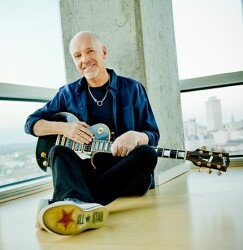 His fifth solo album, Frampton Comes Alive!, is one of the top-selling live records of all time. Jen Gunderman, who will interview Frampton and moderate the audience Q&A, is senior lecturer in music history at the Blair School. Courses she teaches include History of Rock Music, and Women and Rock Music. Gunderman is currently on leave from the Blair School, performing as a member of rock and country artist Sheryl Crow’s touring band. The Conversations Series first launched in 1995, when Jim Foglesong, a top music industry executive and record producer, and classical guitarist John Johns interviewed guitar legend Chet Atkins. 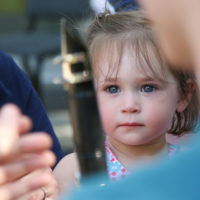 Other artists featured in the series have included fiddler Mark O’Connor, pianist Awadagin Pratt, singer Amy Grant, violinist Joshua Bell, mandolinist and country singer Marty Stuart, songwriter Beth Nielsen Chapman, guitarist and Dire Straits frontman Mark Knopfler, singer Steve Earle, songwriter, composer and musician Randy Newman, singer-songwriter John Hiatt, singer Eddy Arnold, singer Wynonna Judd, and singer and pianist Ben Folds. A Conversation with Peter Frampton will take place at 8 p.m. Monday, December 9, in Ingram Hall at the Blair School of Music. The event is free and open to the public, but tickets will be required. Tickets will be available in the Blair School administrative office at 10 a.m. Monday, November 18. Tickets will be available from 10 a.m.-4 p.m. Monday-Friday, with a limit of two (2) tickets per person. Additional tickets may be made available day of show. For more information, contact Kristin Whittlesey.